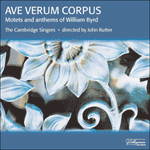 One of the boldest and most ambitious of Byrd’s earlier compositions, this psalm-motet was published in the 1575 Cantiones Sacrae and also appears, adapted to English words, in manuscript sources. As in Turn our captivity, Byrd uses a six-voiced texture not only for intricate imitative polyphony but also for echo effects between high and low voices. Quis est ipse Rex gloriae? Dominus fortis et potens in proelio. Dominus virtutum ipse est Rex gloriae. ye everlasting doors: and the King of glory shall come in. even the Lord mighty in battle. even the Lord of hosts, he is the King of glory.